Gail Dougherty, 61, was a project manager at Intel until she retired in 2016. Now she is working part time at a health center, part of a fellowship paid by Intel as a regular retirement benefit. Jinny Meade, 73, was an Encore fellow at a health center in Oregon a couple of years ago. Now she's a permanent part-time employee. One of those employees is 61-year-old Gail Dougherty. The former project manager now sits at a desk at the Virginia Garcia Memorial Health Center in Oregon, poring over a spreadsheet on her computer. She's crunching patient data with input from doctors and nurses to figure out better ways of delivering care to the health center's high number of patients with diabetes. "Out of my own non-medical, non-health-care ... head, [I] proposed a workflow that seemed like, from what I was hearing might be the most helpful thing for our patients," Dougherty says. Those patients are migrant workers and others who have no health insurance or who qualify for Medicaid. Dougherty says the skills from her old job fit in with her new one, even though the two jobs couldn't be more different. "At Intel, deadlines are king," says Dougherty. "You've got a product, you've got to get it out, either first or by the time you promised. Schedules are king." But at the health center? "Not so much," she says, "because what's primary is the patient care." Dougherty is what's known as an Encore Fellow. She'll work at the health center part time for about a year and receive a stipend of $25,000. This is part of a nationwide program started by Encore.org that brings retiring corporate workers into mission-driven organizations. [You may have heard sponsorship messages about Encore on NPR and other media outlets.] But Intel is the only company that pays the stipend for its retirees' fellowships as a basic employee benefit. In the past five years, the company has paid for about 1,000 fellowships at a cost of more than $30 million. "In the scheme of our total labor cost, it's a very small number," says Ogden Reid, Intel's vice president for human resources. He says it's also a worthwhile expense. "We feel like we're helping our communities," Reid says. "Our retirees give us really positive feedback ... and our workforce that's here see that happening to folks who've had a long career and I think that makes them feel good about the company." Right now, seven Encore Fellows work at the Virginia Garcia Memorial Health Center. Gil Munoz, the center's CEO, says they play a crucial role. "They bring a certain discipline, a certain rigor, to looking at problems and solving them," Munoz says. "Having these Encore Fellows who could help lead a project can be the key to whether it's successful or not." That may be why Jinny Meade, 73, is still here. She came to the health center a couple of years ago as an Encore Fellow. Now she's a permanent part-time employee, working as a project consultant. "I'm sort of the nag that helps them stay on track as much as possible," she says, laughing. 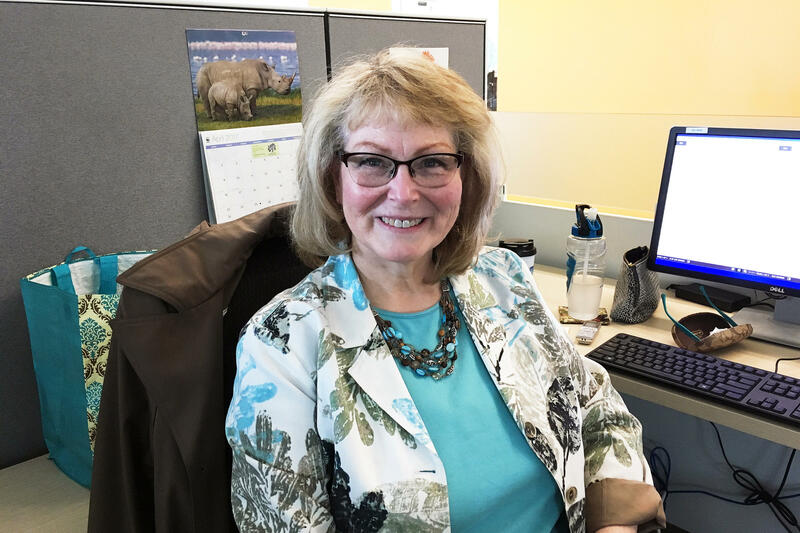 It's rewarding to know that her management skills are serving the mission of the health center, but Meade also derives satisfaction from what she gets back in return. "It's really exciting to be part of something that's ... bigger than ourselves," she says. "Health care for the underserved is a worthy cause." And in Meade's case, it's also a second career. Not everybody who reaches the so-called retirement age is ready to retire, but they may be ready for a change. And Intel would like some of its employees to have some help. Since 2012, the tech giant has paid some of its retirees a stipend while they try out completely new jobs at nonprofit organizations. NPR's Ina Jaffe reports on encore careers. INA JAFFE, BYLINE: Sixty-one-year-old Gail Dockerty is poring over a spreadsheet on her computer at the Virginia Garcia Memorial Health Center in Oregon. The former Intel project manager is combining patient data with input from doctors and nurses. She's trying to figure out a better way of delivering care to the center's high number of patients with diabetes. GAIL DOCKERTY: So I took that body of data. And from that out of my own non-medical, non-health care world had kind of proposed a workflow that seemed like from what I was hearing might be the most helpful thing for our patients. JAFFE: Those patients are migrant workers and others who have no health insurance or who qualify for Medicaid. Dockerty says the skills from her old job fit in with the mission here, even though the two jobs couldn't be more different. DOCKERTY: At Intel, deadlines are king. You've got a product. You've got to get it out either first or by the time you promised. Schedules are key. Here, not so much because what's primary is the patient care. JAFFE: Dockerty is what's known as an Encore Fellow. She'll work at the health center part time for about a year and receive a stipend of $25,000. This is part of a nationwide program started by encore.org to bring retiring corporate workers into mission-driven organizations. You may have heard messages about it on NPR and other media outlets. But Intel is the only company that pays the stipend for its retiree's fellowships as a basic employee benefit. In the past five years, it's meant about a thousand fellowships at a cost to the company of more than $30 million. OGDEN REID: But in the scheme of our total labor costs, it's a very small number. JAFFE: Says Ogden Reid, Intel's vice president for human resources. REID: We feel like we're helping our communities. Our retirees give us really positive feedback about it. And our workforce that's here see that happening to folks who've had a long career. And I think that makes them feel good about the company. JAFFE: Right now, there are seven Encore Fellows at the Virginia Garcia Memorial Health Center. Gil Munoz, the CEO, says they play a crucial role. GIL MUNOZ: They bring a certain discipline, certain rigor to looking at problems and solving them. And having these Encore Fellows who could help lead a project can be the key to whether it's successful or not. JAFFE: That may be why 73-year-old Jinny Meade's still here. She came to the health center a couple of years ago as an Encore Fellow. Now she's a permanent part-time employee working as a project consultant. JINNY MEADE: I'm sort of the nag that helps them stay on track as much as possible. JAFFE: And it's not just the management skill she can bring to Virginia Garcia that she finds rewarding, it's what she's getting back. MEADE: It's really exciting to be part of something that's sort of bigger than ourselves. And health care for the underserved is a worthy cause. JAFFE: And in Meade's case, a second career. Ina Jaffe, NPR News. (SOUNDBITE OF U137's "SLIDING DOORS") Transcript provided by NPR, Copyright NPR.